How exactly would one go about staging a Bob Dylan musical? Conor McPherson, a man who knows a thing or two about haunting stories, has approached it by taking tracks from throughout Dylan’s decades-spanning career – from 1963’s title song to 2012’s Duquesne Whistle from the album Tempest – and used them as the spine for a play-with-songs set in Depression-era America. McPherson avoids ticking the obvious boxes (there’s no Blowin’ in the Wind, this is not a jukbox musical or greatest hits compilation) and instead favours a roaming approach, picking the songs that best sync with the story he’s trying to tell. Girl from the North Country takes place in Duluth Minnesota, Dylan’s birthplace. By setting it in the 1930s, McPherson frees himself from the task of having to marry his material to the period in which the songs were written. He instead explores the seedbed from which Dylan’s songs sprang – a time of extreme poverty, forced migration and economic desperation. Nick and Elizabeth Laine run a guesthouse. Her mind has long been lost to dementia and she is given to inappropriate episodes with male visitors, pawing at them while her cardigan rucks up. She frequently sits on the kitchen table with her legs splayed. While Nick loves her, he’s also having an affair with an elegant widow upstairs. Meanwhile, the couple’s adopted black daughter is pregnant and is having to make a decision about her future, while their writer son has developed a fondness for the bottle. The guesthouse setting allows for a wider social cross-section, and the other residents include a talented boxer, who’s spent time in prison, a malevolent bible-seller, and a married couple with a brain-damaged son stuck in permanent infancy. In fact McPherson crams in too many characters. The Laines’ drunken son Gene has a love interest, but she gets merely a handful of lines and half a song before she’s forgotten. The great Ron Cook is underused as a narrator, and the story itself is three parts spun sugar to one part social commentary. Sentimentality and cliche abound. Yet this all matters less than it might because the cast is superb. There’s not a weak link among them. Ciaran Hinds is gruff yet vulnerable as Nick, while Shirley Henderson is both small and far away as Elizabeth. On one hand it’s the performance you might expect from her, squeaky and quirky, but then she unleashes this mighty voice from her slight frame for her rendition of Like a Rolling Stone. 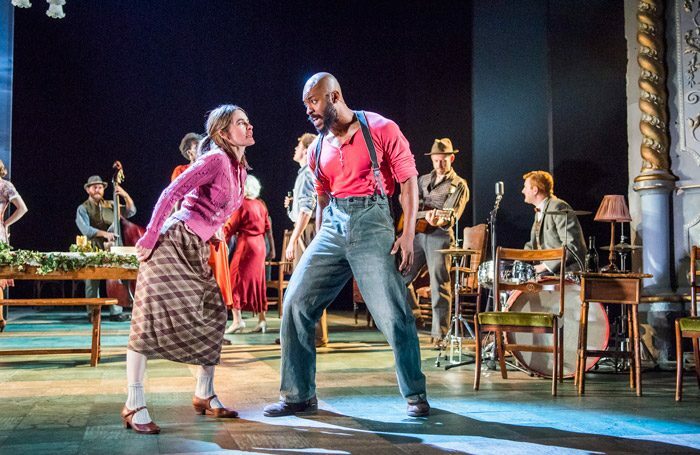 Sheila Atim displays a similar vocal prowess as the Laines’ daughter Marianne, while Arinze Kene, as the boxer Joe, has magnetism to spare and a voice that could melt – well, pretty much anything. Simon Hale’s musical arrangements are glorious and the mixture of story (such as it is) and song works incredibly well. Even when Jack Shalloo, as the brain damaged young man seemingly liberated through death, breaks into song – a moment that should reek of cheese – it ends up being rather wonderful, moving even. In the end, the power of the music wins out and the show sends you out on a high, with Dylan’s lyrics embedded in your head, destined to stay there for days.